As glass dust is created during shipping, gloves and a mask are recommended during handling. Rinse glass thoroughly prior to use to remove glass dust. Prepare area with a weed liner for best results. Spread 2" depth for optimum coverage. The glass landscaping materials need no special care. An occasional good rinsing or blowing with a leaf blower removes dust and build up that may dull the color. The larger boulders should not be shocked with cold water - this can cause cracking. A 2" -3" topping of glass is recommended. NOTE: Propane gas does not burn as cleanly as natural gas, some residue or staining may result. It is recommended to use the darker colors for propane pits and fireplaces. Another option is to use darker colors over the burner, then lighter colors around the edges. 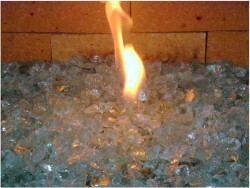 HOW MUCH GLASS DO I NEED FOR MY FIREPLACE OR FIREPIT? ROUND FIRE PITS FOR A DEPTH OF 2"
SQUARE FIRE PIT FOR A DEPTH OF 2"
"Hello TGG Team: We are very excited to have our fire pit conversion finished! My husband did all the work himself and said it was quite easy thanks to The Garden of Glass' products/services. We have already used the new feature more in two weeks than we have since it was originally installed in 2009! The comments from friends and family has been tremendous. They are all planning to either add a fire pit or convert an existing one (fireplaces as well). I've copied the steps taken below and have attached this doc for your files. I will be sending images next. Thank you again for working with us on making this happen. We love it! Our best, Naomi & Jeff Anderson, Cave Creek, Arizona"
Before - Natural wood burning fire pit. Hardly ever used. Step 5 -Fill with striking recycled glass (Honey used here) from The Garden of Glass. What a wonderful, new feature for the pool patio. Even during the day, this new look is stunning. Glass chips can be used in epoxy terrazzo or sand cushion cement terrazzo either by themselves or in combination with traditional marble chips. The combination of sizes #0 and #1 provide a traditional look while the use of sizes #2 or #3 provide a more contemporary appearance. Recycled glass chips are a modern addition to an ancient flooring methodology that dates back to Michelangelo and the Renaissance. Concrete countertops have been extremely popular of late. Customers have been thrilled at the ability to dictate the dimensions, shapes, colors, and textures of their countertops. 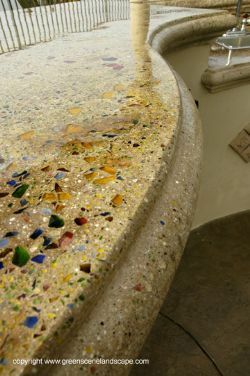 Recycled glass aggregates have been an equally popular additive to recent designs. Glass adds color and variety at a highly customizable level. Interestingly, translucent glass adds a third dimension - depth - to any countertop concept. Some customers even underlight their countertops with LEDs strategically placed beneath our glass chips, a look unattainable with traditional granite materials. Whether it's a do-it-yourself vanity assembled in a weekend warrior's garage or a full-size slab carefully manufactured in a controlled fabrication environment, our glass is resplendent. Glass Aggregate can be used in lieu of or in addition to traditional aggregates. Both light and heavy polishing brings out the glass shine.